The holiday shopping season have arrived, the smell of eggnog and people trampling other humans for discounted prices is in the air. In today's post we cover two important topics; the first is cybersecurity and while you think "password1234!" is secure, we wanted to send you a few refreshers before you type your credit card information in to questionable online shopping sites. We follow it up with some good financial gifts for kids because little Susie has enough Frozen dolls and little Johnny doesn't need to spend any more time on Xbox. According to a recent survey, almost a third of all consumers in the U.S. were victims of a hacked online account in 2017. Currently, online crimes including server breaches are the single largest criminal threat facing small businesses. This means that protecting yourself when you shop online is something you need to take seriously. These seven tips can help you safeguard your information when you buy from an online retailer. Always use a different password for each site or service you use. This is to prevent hackers from gaining access to all of your other accounts if one is compromised. Avoid giving out your password to other people, even friends and family. If the person's computer is hacked, you may wind up becoming an additional victim. Pro Tip: Did you know that if you are a Comcast subscriber, they offer Norton Security Online for free? Check it out here. Yes, you know by now that you should avoid clicking on any links you receive in an email or chat, but are you? Spoofed messages, making links appear to be from a trusted source when they aren't, and redirecting links to a different website have been fooling people for years. Instead of clicking, always type the URL directly in the address bar. Resist the urge of clicking on a pop-up and no matter how great an offer may seem. Once you make a purchase with a debit card, the money is immediately deducted from your bank account. If a cyber criminal gains access to your debit card information, the criminal can quickly drain your bank account. While you may get your money back in the end, you will not have access to your funds until your bank resolves the issue. Instead, use a credit card and let your credit card company worry about it. Cybercrime is scary, but it is part of modern-day life. Taking precautions like those above can help you lower your chances of becoming another victim. One of the most crucial responsibilities parents have raising their children is to educate them in such a way that they are ready to handle the complexities of adult life. While teachers address the usual academic subjects like reading, mathematics, and writing in the classroom, learning about economics and personal finances are left out of the majority of public school curricula. That means the responsibility falls upon parents to expose their kids to these essential lessons. The good news is that there are plenty of ways to help kids learn more about finances that don't have to wind up costing you a lot of money. 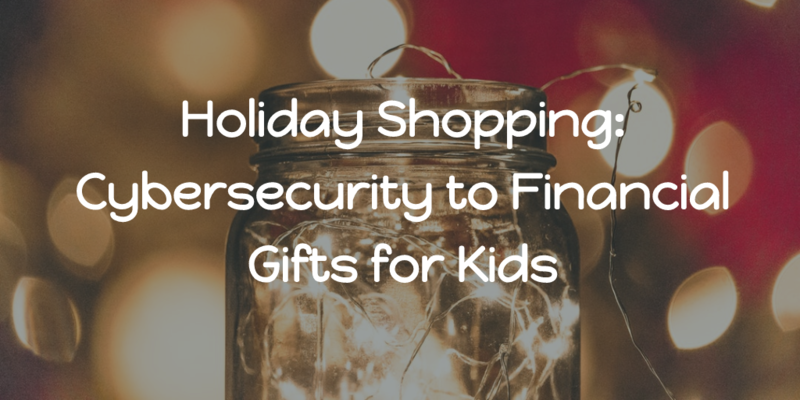 These five unique gift ideas will give your children a substantial advantage when it comes to financial security and money management skills in the future. Gold. Do you want to give a child a present which will not only bring a sparkle to their eyes but will also appreciated in the future? Then it is difficult to go wrong with giving the gift of gold. You can choose to give gold in a variety of forms from coins to gold bars. You can usually find a large variety of gold coins with impressions to match someone's interests. Some givers may even consider gifting gold in the form of jewelry. Whichever form the gold takes, it is essential to explain to a younger child that it is valuable and they should treasure it. Parents may want to hang on to it for their kids until they feel the child is responsible enough. Purchase shares of stock in a favorite company. Introduce the stock market to a child by giving them real shares in the company which produces his or her favorite product. Not only will the child start their portfolio at a young age, but it is the perfect opportunity to sit down to have a meaningful discussion about how the market works and why investing is an integral part of financial planning. For adults who don't want to spend much money on stocks or who want an older child to gain real experience when it comes to buying and selling shares, there are several kid-friendly stock market simulators available online. Contribute to the kid's college fund. While giving money to help pay for college may not be flashy like gold or even as cool as a stock certificate, it can help them in the future. Family, friends, and relatives can make contributions to the child's 529 College Savings Plan (Preferred gift from Santa and all grandparents in the Chubb household!). Amazon Search: "Money Books for Kids." Whichever gift you give, make sure that it makes financial sense for you, too! Be the cool Parents, not the broke Parents. Disclosures: Please consult legal or tax professionals for specific information regarding your individual situation. The opinions expressed and material provided are for general information, and should not be considered a solicitation for the purchase or sale of any security or precious metals.